I’ve had some friends who’ve gone to Paint Nite. It seems to be very popular on Long Island right now. For those of you who don’t know what Paint Nite is, I’ll explain. It’s usually held at a bar or bistro type establishment and you go with a bunch of friends. An artist guides you through painting a picture. They supply everything you need for the night and you go home with a beautiful picture you’ve painted. It’s a fun, enjoyable evening out. This gave me a great idea. What about a Long Island Soap Nite, where friends can gather and create their own scented soap? This past Friday night I had 7 women in my studio. I set up a table for them with goggles and gloves, botanicals and glitter, and essential and fragrance oils. On my table I had 7 pre-measured batches of oil and lye with my favorite purple stick blender. After everyone was seated we got started. Right away they were sniffing all the bottles, trying to choose their favorite scent and looking over the mica colors. Once they knew the color they wanted and had their scent blended (vanilla and coconut was pretty popular scent combination that night, as was the lemongrass and lavender combo) it was time for me to get to work. 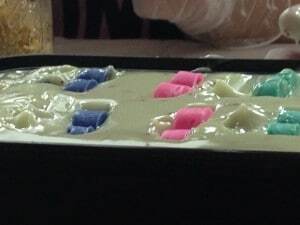 I made the soap and poured it into their molds. Now it was time for decorations! I had colorful hearts and spheres for them to embed into their soap. 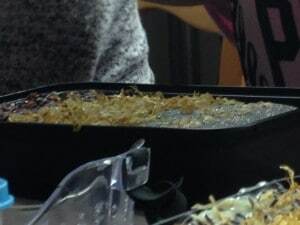 There was also oatmeal, cranberry seeds, lavender, calendula and rose petals for the tops of their soaps. And glitter! Because glitter makes everything sparkle! Ann sent me a picture of her soap after it was cut. Everyone seemed to have a great time and loved the idea of making something useful. They all went home with almost 2 pounds of soap. 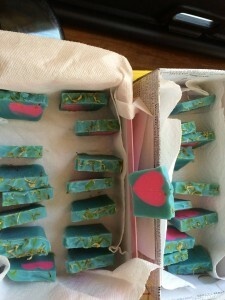 I had a great time sharing my love of soap making. So what do you think? Is Soap Nite something that sounds like fun to you? Sound like a lot of fun. Great idea. Wow sounds like so much fun! Wish I could do that here in the city (in my tiny apartment, alas, no). I think it would go over well in the city Pat. Maybe you could “take it on the road” and do it for different events? Yes! I know it is a fun night! Such a great idea instead of painting or cooking or other night! Great Idea. I live on Long Island send me events and I can share them on my Facebook page. Thanks Sharon, I will do. Sounds like you had a fun night and you sound so organized. Are you still offering classes? Yes Jeannette, I am still doing classes. You can contact me through my website and we will set something up.